The term "grindhouse" brings to mind theaters that show exploitation flicks, although to others, it means your house, and its strobe lighting and 24/7 looping of The Grind VHSs, but like, the good Eric Nies days. Or, delicious meat, at Grind House Killer Burgers. 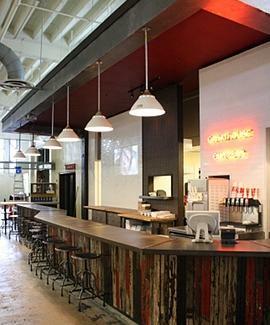 Opening today in the Auburn Market and started by a real estate attorney who went through chef training in Martha's Vineyard as a teen, Grind's an eclectic downtown burger bungalow designed in the mold of classic horror films, with a blood-red-painted ceiling and drip design over the kitchen entrance, a red, yellow & black-paneled bar made from reclaimed wood from a former ATL pencil factory, and a shiny white tiled wall upon which classic Kung-Fu flicks are projected for you to enjoy as you become Chow Yun Fat. All burgers're hand-formed with certified and served on buttered-n-toasted potato buns; create your own by choosing Angus chuck, turkey, or veggie (bean & quinoa), selecting your size (1/4lb single or double), then styling it with veggies, sauces like house-made Chipotle Ranch and 1000-Island-ish Grindhouse, cheese (bleu, Swiss, American, pepper jack), and extras like thick-cut bacon, grilled or fried Vidalia onions (fresh from a market neighbor), Grindhouse Chili, fresh avocado, or roasted green chiles delivered in bricks from New Mexico, by way of Nate Newton's trunk. To limit dangerous thinking, grab one of their six signature burgers, starting with the basic "Grindhouse Style" w/ American & G-house sauce, then up-shifting into "Psycho" (grilled onion & bacon), "Cowboy" (bacon, fried Vidalias, shredded cheddar, BBQ sauce), or the "Gringo", with bacon, sauteed mushrooms, bleu cheese spread, and a sprinkling of playful foreign language derision. Grind's got hand-spun milkshakes (Peach, Coffee, Peanut Butter), soft serve ice cream, and the Blizzard-like "Arctic Swirl" -- also the move popularized by a post-MTV Nies in his slightly less-popular The Grind: Aleutian Swerve.